Worrying questions are re-emerging over Australia's people-smuggling disruption program in Indonesia. Last week, Immigration Minister Senator Chris Evans paid a little-publicised visit to Jakarta for talks with ministerial counterparts on border control and people smuggling. According to Bruce Haigh, writing for New Matilda, Evans' visit was intended to stay under wraps. But persistent media enquiries generated some public briefing. Evans gave a stumbling ABC Radio National interview with Steve Cannane on 16 January. This was followed by a report by Jewel Topsfield in The Age on 17 January. 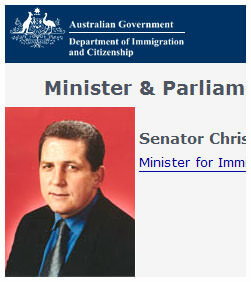 Both stories show a worrying picture of a new minister out of his depth on the sensitive people-smuggling disruption issue, and at risk of policy capture by his department whose present secretary, Andrew Metcalfe, was himself the First Assistant Secretary, Border Control and Compliance Division, in 2000-2001. In those years, DIMIA and the Australian Federal Police together ran the now notorious covert people-smuggling disruption program in Indonesia, a program that gave rise in 2002 to serious questioning in the Australian Senate, from Senators Faulkner, Ray, and others. Many asylum-seeker boats, dangerously overloaded, were sinking, experiencing engine failure or cooking-stove fires, or 'losing their way' during this period. We don't know how many boat people's lives were thus lost. We do know 353 lives were lost when SIEV X sank, and there could have been comparable fatalities on the earlier overcrowded and unsafe Palapa (the boat finally rescued by Tampa after nearly foundering in a storm ), or Olong (the boat towed in a circle by HMAS Adelaide for 22 hours while it slowly foundered). We don't know to what extent, if any, the Australian people-smuggling disruption program may have been involved in the history of such journeys. Until there is a full-powers judicial enquiry into the Australian disruption program — as called for by repeated Senate motions in 2002-2003 — we will not know. Australia's controversial disruption program aimed at preventing people smugglers leaving Indonesia will be retained by the Rudd Government, despite Labor expressing deep concern when in opposition that it may involve the sabotage of boats. Immigration Minister Chris Evans ... said Australia was 'still very interested in people-smuggling disruptions'. 'The concerns about that disruption policy will obviously be addressed by various ministers responsible, but certainly we are very committed to ensuring that we are attacking the people-smuggling operations at source,' Senator Evans told the ABC. Senator Evans added that he shared Senator Faulkner's concerns about some of the past activities, and that the Government clearly would not support people scuttling boats and putting lives at risk. Back in September 2001, at the height of the disruption program, John Howard was offering similar bland public assurances: 'We don't, in this nation, sink boats.' We now know, for example, from Marr and Wilkinson's Dark Victory, what thin ice such assurances rested on. Would Evans and McClelland know now if they were being snowed by the AFP and DIMIA? Perhaps not. Perhaps it is time that Ministers Evans and McClelland sat down for a thorough discussion with Senator Faulkner, who knows more about these matters than anyone else on the Labor Government front bench. How long before another mysterious life-threatening refugee boat incident happens in Australia's northern maritime approaches? Is this what the new ethical Rudd Labor Government wants to see happen on its watch? I don't think so. Time, surely, for the full-powers judicial inquiry into people-smuggling disruption, that Faulkner and the opposition-controlled Senate advocated in 2002 and 2003. Kevin Rudd has the power to set up this enquiry tomorrow. He should seriously consider doing so. Tony Kevin is a former diplomat, author of A Certain Maritime Incident: the Sinking of SIEV X (Scribe, 2002 and 2006 — currently out of print, but a revised edition is in preparation) and Walking the Camino (Scribe, 2007). The most worrying thing is that this so-called disruption is not about people smuggling as it is a legal right for anyone to catch any vehicle they can to get to Australia and seek protection. Going to Indonesia is pointless because they lock up refugees or send them back because they are not signatories to the refugee convention. Surely to god Evans knows that by now? Thank you for opening up this situation for us. Hopefully the advice offered will be put into action. Sounds like excellent advice to me. Legacy was never far from the surface during the State of the Union address delivered yesterday by President George W. Bush. For him, the temptation to solve the complex Palestinian-Israeli conflict has proven irresistible. More money will not necessarily buy quality healthcare system. How funding is spent is critical. Despite the spending disparity, health outcomes in the United States are comparable to those of Costa Rica.